Make social activism a part of your social life. Meet our newest LemonAID Warrior... Doctor OZ! Check out these two videos from The Doctor Oz Show! Lulu shares her book PhilanthroParties! with the audience. She talks to Dr. Oz about how families can add social-good to their social lives. AND don't miss Nana Celines Maple LemonAID recipe created by Lulu for Dr. Oz. Check out the PRAISE including a STARRED review on BookList! LemonAID Warriors activates the next generation of Leaders, one PhilanthroParty Event at a time. LemonAid Warriors are making an impact by making social activism a part of our social lives. In 7 years, our PhilanthroParty Planning Guides have helped raise over $150,000 for local and global causes and inspired over 4000 hours of volunteer service. Our action plans have been downloaded over 165,000 times and inspired hundreds of PhilanthroParty events worldwide. Check out this video of our founder, Lulu Cerone to learn more. And sign-up below for PhilanthroParty Planning tips and tools to throw your own PhilantroParty! Thank you for signing up! A confirmation email has been sent to your email. Please check your inbox to confirm your registration. When Lulu was 10, she learned that each cup of lemonade she sold for $1 can provide a person in Africa with clean drinking water for one whole year. Inspired by the life saving power of even the smallest donation, she set up a Boys vs Girls LemonAID challenge for her fifth grade class. They exceeded all expectations by raising $4,000 and had so much fun doing it that her classmates didn't want to stop. So she founded LemonAID Warriors to share creative action plans and provide PhilanthroParty Planning Guides to make social activism a part of her generation's social life. Eight years later, LemonAID Warriors has raised over $150,000, provided clean water for thousands of people in Africa, sent hundreds of children to school, and supported dozens of other local and global charities. Lulu published her book PhilanthroParties! 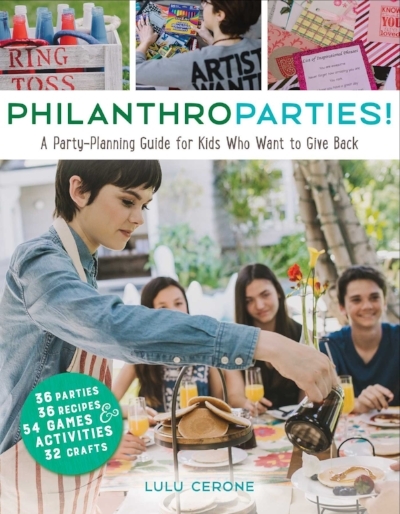 A Party-Planning Guide for Kids Who Want to Give Back through Beyond Words/Simon & Schuster, teaching young people how to party with a purpose. Madi chosen as Top Teen in Ventura Blvd Magazine. Click here! I was in Kindergarten when Lulu invited me to my first PhilanthroParty. I fell in love with the concept that giving back can be so much fun and have a powerful impact. I participated in every LemonAID Warriors event and was soon inspired to create my own. I hosted a Beauty Brunch to support homeless women, Can Carnivals for the hungry, Art With A Heart for hospitalized children and more. Eventually, I started my own charity called Believe, and launched it at my Bat Mitzvah where guests were invited to make bracelets for hospitalized children. I expanded to include a partnership with my friend, and we plan to address local poverty issues through direct service and advocacy. I'm a proud member of East Valley YMCA's Youth & Government and active in Women's March events. I founded our first LemonAID Warriors High School Club. In our very first year, we were honored with my school's award for creating impact through service. This 3-step philanthroparty guide gets you started. Add a creative twist to any gathering to make giving part of the fun. Be inspired by the theme of your chosen charity! Plan activities, recipes, and decorations that relate to the cause. If you love animals and you're having a pool party, have guests bring in old towels to donate to shelters and bake doggie treats! Check out this DIY video! Want to learn about other creative ways our warriors have transformed their parties? Read about the PhilanthroParties that were inspired by our work. Looking for more detailed PhilantroParty Planner? Download our checklist. We launched our first High School LemonAID Warrior Club this year! 72 students signed up to join our community events and campus lunchtime PhilanthroParty events. We served The Red Cross ( for hurricane relief), The Conor Lynch Foundation (teen driver safety), St. Judes Hospital, Guide Dogs of America, Midnight Mission. We raised over $1400.00, and each member had the chance to log in up to 22 community service hours. Stay tuned for our guide to starting your own LemonAID Warriors Club! And check out the video of our final Lunchtime PhilanthroParty below! to see our amazing Warriors, Jasper and Mason support Parkland students and March For Our Lives. They led a symposium on gun violence, raised $1300.00 for March for Our Lives, selling tshirts they designed and also led their school's National School Walkout to end gun violence. We're really grateful for the press and partners who have told our story. Here are just a few who have helped LemonAID Warriors spread our message. A special thank you to Nickelodeon and KTLA! Step up to our LemonAID Stand! 100% of your donation to LemonAID Warriors will go towards furthering our mission of creating the next generation of change-makers, as well as our signature projects, listed below. If you prefer to donate to a specific LemonAID Warriors project, please specify on the donation page. Otherwise, funds are used to support youth-driven community service events and the fully vetted non-profits they support. 1. We provide scholarships and school meal plans for students in Zimbabwe with our partners at African Bush Camps Foundation. Read about the work we've already done together and watch our video! Consider a $90.00 donation to purchase goat in the new Goats for Education Project. Each goat purchased will be taken care of by a student and will help them earn their school fees! Please specify African Bush Camps Foundation when when you make your donation to this cause. 2. We host holiday parties at a local domestic violence shelter. 3. In 2017, a group of Warriors, led by warrior Nicholas and Jasper, completed the construction of a dorm at a Corazon de Vida orphanage in Tijuana. With your help, in 2018, we are fundraising to complete a playground and a laundry room at the orphanage.